In these turbulent times, politics isn’t just for politicians. 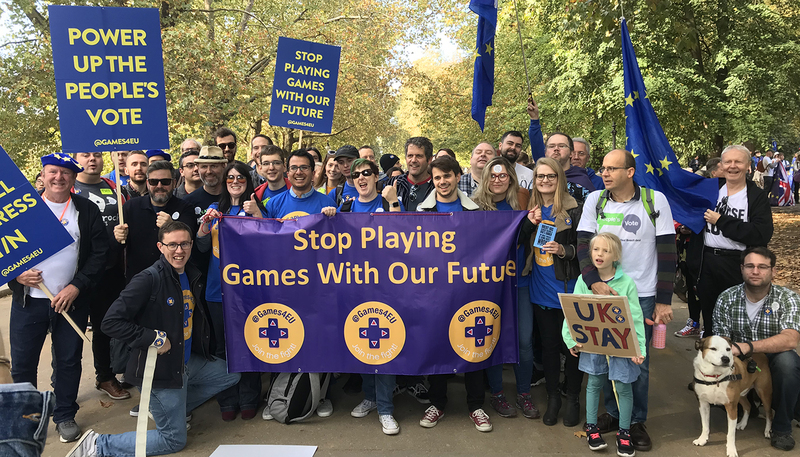 George Osborn (not to be confused with the former UK Chancellor) tells us why Brexit is such a big issue for the gaming industry, and what his campaigning group Games4EU plans to do about it. FEED: Can you tell us about the work you were doing before you started Games4EU? Gamer and their events, and started writing content for a whole range of different game sites. Now I run my own content marketing business, Go Editorial, and I work with a variety of companies on a lot of different projects, helping publishers do their community management or helping companies produce content. FEED: So how did Games4EU come about? George Osborn: What happened was that alongside all that, I’m also a political animal: I became a political animal after the Brexit vote. It was the 24 June (2016), the morning after the referendum, and I was obviously staggered by the result. George Osborn: Because no one had really expected that. All of the build-up had been that this would be a comfortable win for Remain. The campaigns hadn’t gone brilliantly for the Remain side, but the pollsters had been indicating Remain would probably win it. So to wake up to the Leave vote the following morning – and my network of friends would not necessarily have been the kind of people who would have voted Leave – I really hadn’t seen it coming. The thing that turned me much more political was, later that same day, I received a call from a European client who said, “Well, you know, we’ve been paying you in euros up until now, but we can start paying you in pounds.” This was after the pound had tanked by about 10% to 15% that morning. Suddenly it was the realisation: this is what this means for the country. We are now going to lose our position of power and we are going to lose leverage, and it’s going to make it harder for us to do business in the long term. So I joined a political party and worked at it from that angle. But then there was the People’s Vote march in London in June 2018. I went there and saw that there were loads of other people from the video games industry along too. But there was no group organising us together. So I ended up speaking with Tracey McGarrigan who was on that march. She’s the co-founder of the PR agency Ansible Communications. FEED: So you were just walking along there and had a chat about Brexit? We ended up organising a morning brunch at Develop Conference, which is in July in Brighton. Lawyer Jas Purewal (digital entertainment lawyer and founder of Purewal & Partners) was one of the people who came along. Jas gave us the legal and policy support to have the confidence to turn it from being a little organisation for uniting people in the games industry into a campaigning group. FEED: There are a lot of people who think “Oh, we should do something about this” around an issue, but they aren’t able to complete the basic actions needed to get the thing off the ground. What things exactly did you do? George Osborne: The first thing we did was try and test whether there might be an appetite for a group like this. I’ve got a reasonably decent Twitter following, mostly drawn from the British video games industry. So I put out a tweet which asked whether people thought the UK video game industry was pro EU. I know it’s very simple, and not particularly scientific, but within 24 hours we had almost 1000 likes on that tweet. And in the context of the British video games industry, that actually would be quite a sizeable percentage, so we thought we had something. The next stage was Tracey and I drawing up a list of people we knew or had seen tweeting about pro-EU topics, and getting their email addresses, and saying, “Look, we’re going be hosting this brunch in Brighton on this day. Do you wanna come along?”. We had about 20 people coming along from the video games industry to that first meeting. The most difficult bit of it was actually getting everyone’s brunch orders right. FEED: And how did that first meeting at Develop: Brighton go? George Osborn: We were obviously a little tense, getting ready to pitch the idea. But it really flew with people, and they were really encouraging us. People really wanted to make sure that we focused on the big issue at hand in relation to the games industry, and all the different permutations of what would happen if we left the European Union. We wanted to campaign on the basis that we think remaining within the European Union or as close to it as possible is essential. That was a key conceptual point. We also put together a document that said: “This is what we’re doing. This is what we are standing for”, and we’re using that as kind of a lodestar around which we based everything else. Between the point we founded in early summer 2018 and now there actually wasn’t time to do too much. We had to make sure we were really focused and thinking about what we could do that would make the most difference. FEED: So what do you stand for? What were those things that you got down in that document? 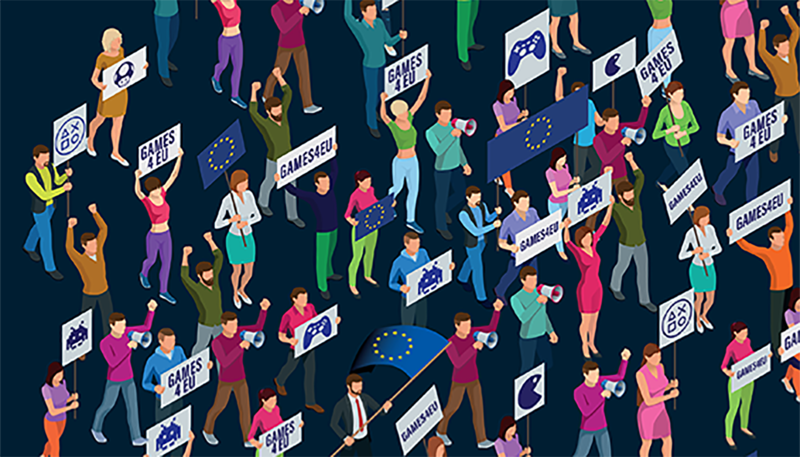 George Osborn: Games4EU’s most important position is to campaign on behalf of the British video games industry to stay within the European Union or as close to it as possible. That was our starting point. That seems quite a basic point, but it’s informed a lot of our actions since then. We’ve been looking at all the developments in the political world, and it’s been rather chaotic. But because we’ve had such a clear position, it’s enabled us to look much more closely at the things we support. Rather than just going out and doing absolutely everything possible, we’ve been trying to spread that message on a wide basis. We’re also going to MPs who have video game companies within their constituencies and explaining to them what the risks are for those businesses. FEED: I would have thought that the constituencies with lots of video game companies would have fewer Brexit voters. George Osborn: Surprisingly, there are some constituencies with video game companies that voted for Brexit. One of the things about the British video game industry is it’s a truly national industry. Obviously there’s a large concentration of companies within London, but there are over 20 cities in the UK with more than 20 video games companies in them. I think Manchester itself voted to remain, but the constituencies surrounding it, many of them voted leave. Then we took that letter to the 200-odd MPs who have video game companies in their constituencies, with the full list of signatures so they’re aware of the strength of feeling. Alongside that, we combined forces with (software development company) Tech For UK and sent the letter on to the Prime Minister directly. I think it was actually handed in physically to Downing Street, alongside a small delegation of people. We also produced a 51-page guide that indicated what could happen to video games companies if there was, say, a no deal Brexit. We drew a lot upon Jas Purewal’s background and his expertise as a games industry lawyer, and also upon a number of volunteers who’ve been supporting our organisation to help produce a clear, and in our opinion, measured analysis of what would happen. FEED: So tell us what some of those things are. What’s the big problem? George Osborn: The one that people are most aware of is access to talent. UKIE published its “State of Play” report (ukie.org.uk/brexit) which surveyed the games industry to find out how many employees were EU Nationals – ie. were not from the UK – and the research indicated that about a third of people working in the British video games industry are EU Nationals. What that means in the case of either a Brexit deal that limits free movement or a no deal situation, is that it could lead, for example, to companies having to deal with securing visas for all of their current employees. The visa process at the moment is costly, time consuming, and difficult to get through. Some of the costs associated include companies having to pay in excess of £500 every four years to be a visa sponsor. They then need to pay immigration lawyers. If they are hiring someone who’s from what is defined as “rest of the world”, they also have to pay things like an immigration health surcharge, which is about £200, and a further immigration charge. UKIE’s report estimated the cost of hiring employees who are outside of the free movement area at roughly £10,000 per employee. Everyone has been talking about GDPR and making sure we were compliant and that our businesses were ready for it. But the big concern with a no deal Brexit is that regarding data, we would now be considered a third country. Even though we played an integral role in what has gone into GDPR, and agreeing to those regulations, the European Union would have to treat us as a third country with an uncertain data standard. That could lead to disruption of data flows, and disrupted data flows could mean disruption to services. It could be disruptions for streaming services, or it could mean that in things like multiplayer games, UK players have to be hived off into a separate service to prevent their data from flowing across borders. The government have expressed a hope that they will get a data adequacy agreement, but they have not fleshed out what that will be, whether we will adopt the same standards, or whether our standards will diverge. That will contribute to a wider problem with Brexit, which is this uncertainty, where people don’t know what their legal status is. There’s a wide spectrum of issues, and it’s one of those things where the more we look into it, the more challenges that we’ve identified and, to be quite honest, that people didn’t know about. Our major objective is to try to flush those issues out, to try to make it as clear as possible what could happen to the industry, and do what we can to campaign against it. FEED: In talking to people, what has been the general awareness level about the effects of different Brexit scenarios? George Osborn: We found that there were essentially two tiers of how much people knew about what was going on. The major international game publishers were aware of what was going on and were planning for it. They were aware of many of the issues, and in many cases a lot of them were aware of particular problems. Not all of them though. We have had a few people at major publishers saying ‘thank you’ for our Brexit guide. I think for the most part that was how people were going to be dealing with Brexit. They were essentially waiting for the problem to emerge, and then whack it on the head. We’ve been trying to surface those issues as early as possible so people talk about it now. If businesses aren’t thinking about no deal now, there’s a real possibility that if we were to somehow crash out, they could be in real trouble. FEED: We know that Brexit will have ramifications in the UK, but how could it affect business in Europe? George Osborne: The European Union will be affected because the UK is one of its largest markets deciding to potentially step away, reduce trade with it, or potentially completely collapse trade in the case of no deal. That would particularly affect communities in France, Belgium, the Netherlands, anywhere close to the UK where trade would be particularly strong. I think Europe’s main concern is just maintaining the integrity of the European Union, maintaining the single market, making sure the full freedoms are adhered to, and that its members stay on side. Their biggest concern would be the collapse of the union. The EU was designed initially as a vehicle for increasing peace on the continent, bringing people together, preventing them from fighting with one another, so it’s within that context that politicians in Europe principally understand the European project. Then their biggest concern is about defending that and that means they would much rather be tougher on the UK to ensure that they keep that in place. They are also concerned about things like finance. The UK has got a very strong financial sector, and they want to make sure that European businesses can still get access to that capital. On top of that they’re also concerned about the idea of the UK potentially breaking away and creating like a Singapore in Europe, with low regulation or really absolutely free trade. If that were to happen, it could lead to things like the deformation of the farming industry, because standards of agricultural production would disappear and any old people could start trading with us. FEED: Could it mean a boost for EU creative industries as fewer artists and developers come to the UK? George Osborn: Already, earlier this year, Sega moved part of its testing away from the UK to Bulgaria. They said, “This isn’t related at all to Brexit. We promise it’s not related.” But at the same time, they have chosen to relocate part of their business to a country that sits within the European Union and its framework and allows them to freely move employees there and take advantage of the lower cost in terms of labour. What I think will happen is businesses will start looking at the examples of companies like easyJet, whch has headquarters now in Vienna. Companies currently in the UK will find a way to headquarter themselves in Europe instead. FEED: Looking at it from the other end, are there any benefits Brexit could bring? The industry is quite resilient, self-reliant, and because there are already workers across borders quite effectively, it would be well-placed to deal with the damages there. Every week that this process goes on, the more it seems like Britain has become an inward nation, that it doesn’t understand how the modern world operates, that it wants to go back to when the Empire was still a big thing, rather than actually a country that’s ready for the modern economy. But it couldn’t be further from the truth of what this country is. This article first appeared in the January issue of FEED magazine.